Delicious and tender Slow Cooker Smothered Pork Chops sound delicious for a family dinner, and the gravy is thickened with cornstarch so this recipe is gluten-free! Click here to see The Best Instant Pot Pork Chops! 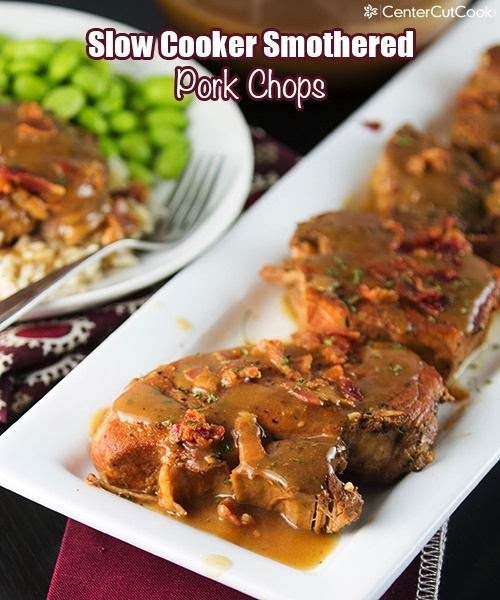 For Friday Favorites we spotlight past recipes that you may have missed, and these Slow Cooker Smothered Pork Chops from Center Cut Cook could quickly become a favorite! Smothered pork chops with bacon and brown gravy get deliciously tender in the slow cooker; what more do you need to know? Ashley from Center Cut Cook says she hardly ever made pork chops until she tried this recipe and now these Slow Cooker Smothered Pork Chops are a favorite at her house. Get the Complete Recipe for Slow Cooker Smothered Pork Chops from Center Cut Cook. I made this recipe today . We all 4 voted on the results and decided it was ok. As was suggested by the blogger, this recipe was a bit of work for a slow cooker recipe. I needed to add 3 times the corn starch for it to be gravy consistency. I think when I make it again I would spice up the gravy a little more, also. Pam, thanks for the feedback! Made this tonight, and it was pretty good. I served it with mashed potatoes, and my husband said pork chops + mashed potatoes = awesomeness. It made a pretty good gravy. I thought the pork chops, although fall-off-the-bone tender, were a bit lacking in flavor because of the long cook time. I did not puree the leftover onions into the gravy and just used the liquid as I thought the onions flavorless after being cooked all day. I think the next time I make this, I will probably do this on the stove and skip the crock pot. I think the pork chops will be better done that way. The only other thing I did differently was I did not bring the broth and sugar to a boil before adding it to the crock pot, and it worked fine..
Emily thanks for giving your feedback.